Yet another fascinating discovery from Toccata Classics. Ernst Krenek’s limited profile today rests largely on his operas, but these piano concertos present another side to the composer. The first three, programmed here as volume one of a complete set, span the years 1923 to 1946. The first is tonal and Romantic in spirit, although with many sections of dense chromaticism, while the Second and Third are serial. 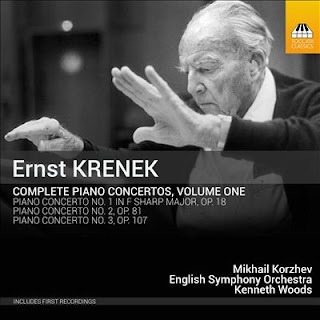 Yet there are as many similarities as differences, particularly in the flowing piano lines and the colourful orchestration, but also the relaxed approach to form and the space Krenek always gives for the often complex relationships between piano and orchestra to play out. The First Concerto was written in 1923. The composer was then in his early 20s, but this is far from juvenilia. A small orchestra is used, but to impressive effect, especially the lone trumpet, whose interjections are a defining character of the piece. Connections with Krenek’s later serialism are suggested by the couplings, and come through most strongly in the long and winding, but always clearly focussed, phrase shapes, especially in the orchestra. Krenek takes many aspects of the concerto genre for granted. He has little interest, for example, in grand opening statements of conclusive finales, and both of the first two concertos open and close quietly. And the solo writing, while clearly virtuosic, never sets the pianist strongly apart from the ensemble. My only complaint about the First Concerto is the insistent dance rhythm throughout the finale, which outstays its welcome. But if it worked for Tchaikovsky, then why not Krenek? Peter Tregear, in his excellent liner note (one of three – stimulating contributions are also offered from conductor and pianist) describes the Second Concerto as Bergian, an apt comparison for a work that adheres to serial technique but without ever seeming insistently or antagonistically modern. That said, Krenek’s approach here was apparently in deliberate opposition to the growing Nazi influence on the arts: It proved to be his last work before leaving Germany for America, where he spent the rest of his life. The Third Concerto was commissioned by Dimitri Mitropoulos, who gave the premiere with the Minneapolis Symphony Orchestra, directing from the piano. It’s a shorter and terser work, with a more extrovert solo part. The ominous piano left-hand rumblings with Shostakovich-like horn calls at the opening set the tone. Later we hear some surprising percussion interjections – the snare drum in particular suggesting some narrative subtext beneath this otherwise rigorously abstract music, and the sound of the pianist brushing the strings under the lid adds to the already broad palette of orchestral colours. The performances do full justice to the music. Pianist Mikhail Korzhev is able to make even the most knotty of Krenek’s serial textures flow naturally. His tone is warm, and his phrasing ideally focussed. The orchestra copes well with what must be an unfamiliar idiom. A little more character to the string tone might have made this music sound more symphonic, but the playing can never be faulted for accuracy or balance. Ken Woods leads vibrant readings, suitably broad in the First Concerto and suitably atmospheric in the Second. The Third Concerto includes some surprising tempo shifts, often mid-way through phrases, but again, conductor and players always make the results sound natural. Sound quality is good. The piano sounds a little constricted, while some of the orchestral sections seem curiously highlighted, the results sometimes a little unnatural, but if this is the price for such fine balance between piano and orchestra, so be it. Smart packaging from Toccata, with photos of all concerned, and the cover image, of Krenek conducting, also printed on the disc itself – a nice touch. The contents of volume two seem a little unclear – there is only one more piano concerto, the Fourth, but also a Double Concerto, for violin and piano, which would be a logical choice. Whichever way, that second volume should be worth looking out for, as is this first. Recommended, in the hope that Krenek’s concert music finds the audience it deserves outside of the ranks of modern music historians.